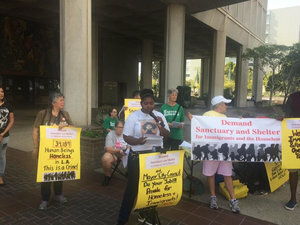 My name is Kennedy Moore and I’m an alumnus of the Women’s Leadership Project, a feminist of color civic engagement and mentoring organization based in South L.A. We strongly support this petition to make L.A. a “Sanctuary City” for all. As many of you are aware, the majority of homeless in L.A. are African American. The black face of homelessness in L.A. is a human rights crime that has been perpetrated by this city for generations. Over the past few decades, L.A. has become a haven for multi-million dollar gentrification schemes that have made living here grossly unaffordable for people of color. It’s criminal when it’s become commonplace to see people lying on the streets and sidewalks because there is no affordable housing. It’s criminal when city officials allow multi-million dollar developments to be built in communities of color where poor and working class residents are being routinely displaced and dispossessed from their homes. As a young person growing up in South L.A., I became accustomed to seeing my neighborhood blighted with empty lots and boarded up buildings. It’s a crime to have thousands of black and brown folks struggling to survive in shelters, cars and on the streets or doubling and tripling up in their family’s homes. Downtown Los Angeles continues to explode with high end retail and residential development that caters to the elite. At the same time, downtown’s homeless population, which is majority African American, female and older, continues to be pushed to the brink. And setting aside 5 to 10 percent of new developments for affordable housing will not cut it for the scores of black, brown and immigrant youth who comprise the majority of homeless youth in L.A. The city needs to address these human rights abuse and open habitable spaces and buildings to homeless communities who are bearing the brunt of economic depression, joblessness, mass incarceration and sexual violence. On behalf of the youth of the Women’s Leadership Project the city must take immediate action to provide shelter and services for homeless and sanctuary for immigrants living in fear of detention and deportation."